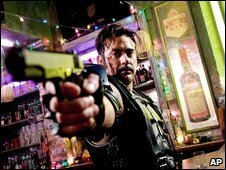 Jeffrey Dean Morgan stars as The Comedian in the Watchmen filmOrganisers of a Scottish comic book convention are expecting hot debate on the forthcoming film version of the cult Watchmen graphic novel. Author Alan Moore has already disowned the adaptation, insisting his name be taken off the credits. His daughter Leah, a comic book writer in her own right, and the novel’s colourist John B Higgins will be guests at February’s Hi-Ex 2 in Inverness. Organiser Richmond Clements expects the film to be a major topic of discussion. Also due to appear at the Inverness convention are Mick McMahon, a comics creator and the artist on the first Judge Dredd story, and Superman comic book artist Frank Quitely. Other expected guests are Leigh Gallagher, who has drawn for the Lego Bionicle comics and also DC Comics’ The Witching and Justice League Unlimited. It is hoped Lee Carter, who has worked on games titles such as Project Gotham Racer, and Asia Alfasi, a Manga comic writer and artist who was born in Libya but moved to Scotland as a child, will also attend. A children’s competition for original comic art was launched in November to tie in with the convention. Mr Clements said the second year of the event could determine whether it becomes a permanent fixture. Held in Eden Court Theatre, some guests for the inaugural 2008 event were unable to attend because of bad weather. However, many of those who did make it agreed to appear again. The convention will run just days before the US and UK releases of the Watchmen movie. While the graphic novel has had a cult following, hype surrounding the film has been building with its characters appearing on the cover of Empire film magazine. Hollywood director Zack Snyder has promised his adaptation will be faithful to its source. Presenting three excerpts from his forthcoming film at a press event in London in November, he said he wanted to give audiences the “quintessential” Watchmen experience. Dave Gibbons, who drew the illustrations for the original 1987 comic, said Moore had previously had “bad experiences” with Hollywood. Previous adaptations of the writer’s work include The Extraordinary League of Gentlemen, which starred Sean Connery, and From Hell, which had Johnny Depp in the lead role as a clairvoyant detective investigating murders by Jack The Ripper. Snyder, who directed the 2004 remake of zombie horror Dawn of the Dead and the 2006 movie 300, said he was “disappointed” by Moore’s decision but respected his wishes. Set in an alternate version of 1980s America, Watchmen imagines a parallel universe where masked heroes and crime-fighting vigilantes are commonplace. Only one, though, has super powers – the luminous Dr Manhattan, a scientist who acquired god-like abilities after a laboratory accident. Mr Clements said: “The Watchmen film will be a big event. “It is likely to be the subject of debate at Hi-Ex with John Higgins and Alan Moore’s daughter Leah – a writer in her own right – coming up. “I have seen the trailer and it looks extraordinary. The convention organiser said themes tackled in Watchmen were relevant to today’s troubled times and conflicts in Afghanistan and Iraq. One of the characters, The Comedian, whose murder is one of the key storylines of the graphic novel, fought in the Vietnam War. Comparisons are often drawn between that war and today’s conflicts. Meanwhile, zombies could be another theme at Hi-Ex. Mr Clements said: “I am thinking about doing something on zombies, there seems to be a huge market and they seem huge at the moment.